WE PERSEVERED AND WE OFFER OUR NEWEST FORMULA WITH A VERY HIGH CONCENTRATION OF EGF! IN 1986, STANLEY COHEN RECEIVED THE NOBEL PRIZE FOR HIS WORK ELUCIDATING THE ROLE OF THE EPIDERMAL GROWTH FACTOR (EGF) IN THE REGULATION OF CELL GROWTH AND DEVELOPMENT. EGF IS A GROWTH FACTOR THAT PLAYS AN IMPORTANT ROLE IN THE REGULATION OF CELL GROWTH, CELL PROLIFERATION, AND DIFFERENTIATION. AS WITH ALL GROWTH FACTORS, IT IS A SMALL PROTEIN. EGF ACTS BY BINDING TO SPECIFIC RECEPTORS ON THE CELL SURFACE, STARTING A CASCADE OF VERY ORGANIZED MOLECULAR EVENTS; INCLUDING INCREASED INTRACELLULAR CALCIUM CONCENTRATION, ENERGY PRODUCTION, AND PROTEIN SYNTHESIS. EPIDERMAL GROWTH FACTOR (EGF) IS A POWERFUL PROTEIN THAT, WHEN APPLIED TO THE SKIN, ACCELERATES HEALING AND INCREASES THE RATE OF SKIN RENEWAL ON AGING SKIN AND GRADUAL SKIN THICKNESS. OUR MIRACLE CREME HAS BEEN FORMULATED WITH THIS PROTEIN WITH A HIGH LEVEL OF EXPERTISE, AND THE END RESULT IS A HIGH-QUALITY PRODUCT MADE SPECIFICALLY FOR SKIN CARE APPLICATIONS. WE HAVE RESEARCHED EGF (EPIDERMAL GROWTH FACTOR) FORMULA ON THE MARKET. 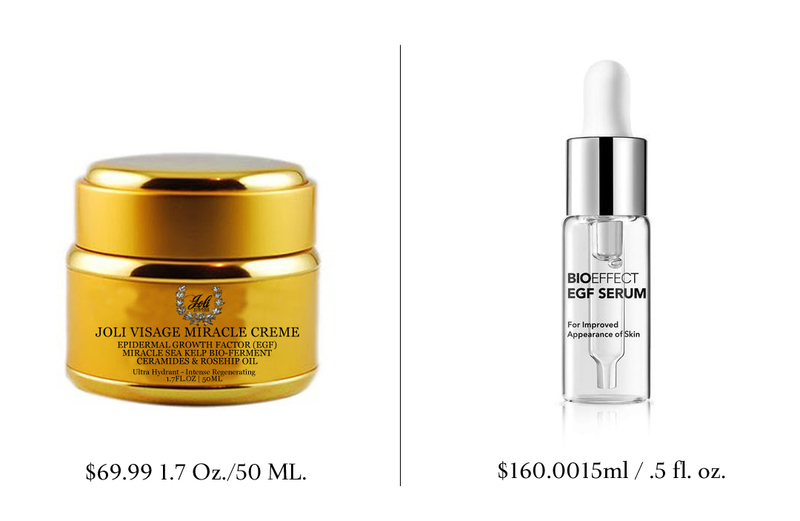 LE MER AND REVIVE CONTAIN EGF & SEA KELP WITH LOWER LEVELS OF ACTIVE INGREDIENTS AT $250-$400 PER OZ. MIRACLE CREME BY JOLI VISAGE IS CONSIDERABLE BETTER VALUE AND DELIVERS BETTER RESULTS! MY HOLY GRAIL CREAM! I HAVE ECZEMA-PRONE SKIN AND I NOW HAVE MATURE SKIN AS WELL (EARLY 40S) AND IT HAD NOT BEEN EASY TO FIND ANYTHING THAT CREATED A NON-OILY LIPID BARRIER TO THE ELEMENTS ESPECIALLY AS I LIVE IN THE NORTHEAST U.S. AND THE WEATHER IS POLLUTED AND CAN BE HUMID OR BLUSTERY COLD. THE EGF HAS SOFTENED MY FINE LINES LIKE CRAZY AND I'VE TOLD MANY OF MY FRIENDS ABOUT THIS TO PASS THE GOOD NEWS ALONG, AND HEAR REPORTS THAT THEY LOVE THIS CREAM TOO. OF COURSE, THEY ALL HAVE DIFFERENT KINDS OF SKIN AND THIS CREAM STILL WORKS FOR THEM! THE LE MIRACLE CREME IS UNBELIEVABLE! MY SKIN IS INCREDIBLY DRY AND SENSITIVE. EVERYTHING MAKES MY FACE STING OR BREAK OUT...EXCEPT THIS! IN FACT, IT HAS MADE MY ROSACEA MUCH LESS NOTICEABLE AND MY SKIN FEELS SOFT AND HEALTHY. I USE IT ON MY DRY HANDS TOO. I'M IN THE MEDICAL FIELD AND WASH MY HANDS A LOT, SO MUCH THAT THEY GET CRACKED AND PAINFUL. UNTIL I STARTED USING THE MIRACLE CREME CREAM ON THEM BEFORE BED!! I LOVE THIS STUFF! IT'S A MIRACLE IN A JAR!! skin is extra dry I add the Face & Body Oil with all the 5 oils in one, then i just put over cream.